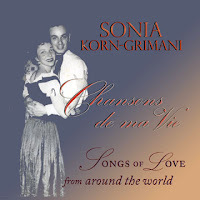 We talk today with Sonia Korn-Grimani, celebrated singer and author. Her memoir Sonia’s Song, about her childhood in Germany and Belgium just before and during World War II, has been recently published in English by Clay Grouse Press, and Sonia has also just released a beautiful album called Chansons de ma Vie, which features over twenty recordings of her songs from throughout her long and celebrated career. Sarah Beth: Sonia, thank you for talking with us today. In your book, you describe the first time going to church and singing the Latin mass. Was that the first time you sang at all? Sonia: As a child, I sang German Lieder with my mother, and we sang Brahms’ Lullaby, as well as Schubert's Serenade and his beautiful Ave Maria. My mother had a lovely mezzo soprano voice. She always said: "Music is the food for the soul.” Later on, after we had been smuggled out of Germany, and I was hiding in the Catholic orphanage, I sang the daily mass every morning with the orphan choir. Sarah Beth: How did singing help you get through all the losses that you were experiencing at the time? Sonia: When I was living at the orphanage, I found it very hard being separated from my parents, and was finding it difficult pretending to be someone I wasn’t, having to let go of my old identity. But I was fortunate, because I had the chance to sing every day. I could lose myself in the beauty of the music of singing the mass, and I felt like I could reach God through my song, and ask Him for mercy for my people. I know it seems like a silly thing to think, but at that time, it made me feel strong and powerful, at least as much as any 11 year-old girl could feel in a world spinning out of control. Sarah Beth: And then after the war, did you continue to sing? Sonia: After the war I attended the Brussels Conservatory for piano and singing lessons. I felt enormous support from my teachers and peers. Although I was very shy, I sang wherever I could. After we moved to Australia, I enrolled in Melbourne University Conservatory for singing and piano. I threw myself in studying music. I wanted to give back to the world with my song. I wanted give joy to people, the same joy that music gave me. Sarah Beth: With all the disruptions and upheavals from moving halfway across the world and starting over, it was almost like music was the one constant in your life. Sonia: It was, most definitely. Sarah Beth: Shortly after you moved to Melbourne, you got a job presenting the news live, in French, on Australian Broadcasting’s “Radio Australie.” When did you first start to sing on radio? 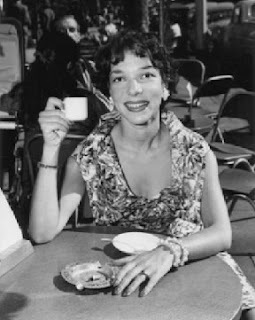 Sonia: In 1953, I successfully passed an audition for the Australian Broadcasting Commission, to sing on their program "Young Australians Sing." It went so well, I became a regular on the show. Sarah Beth: Were you nervous singing live on radio and later on television and in concerts? Sonia: Yes, as I was so shy, I suffered from tremendous stage fright quite a bit before each and every performance. My fiancé, John, later my husband of 56 years, encouraged me a lot, as did my devoted mother. They were my support system. Sarah Beth: What do you think your life experience has brought to your music, and conversely, what has your love for music brought to your life? Sonia: I feel a profound love of music, and it has filled my life with incredible beauty, all of which I want to share back with the world. This interview is part of a very special event on The Muffin—Everybody is Talking About Finding the Music in Life. We are celebrating the release of Sonia’s Song, a memoir by Sonia Korn-Grimani (Clay Grouse Press, March 5, 2012). Visit the participating blogs for a chance to win a copy of Sonia’s Song. After the war, Sonia studied music at conservatories in Brussels, Belgium, and in Melbourne, Australia, and at 17, she became the youngest broadcaster on Australian Radio. Soon she began to sing live on the radio and on television, and quickly became an international sensation. She sang to the delight of audiences throughout the world on her weekly live radio and television programs in Australia and Malaysia during the 1950s-1960s. Off the stage, Sonia became a champion of women’s rights, a French tutor to a queen and two prime ministers, and was named Chevalier and Officier by the French Government for her contributions to French culture. Sonia's story truly is remarkable. I feel very fortunate to be involved in this mass blogging day event! I listened to her singing and it is beautiful. I also enjoyed the family photo album.